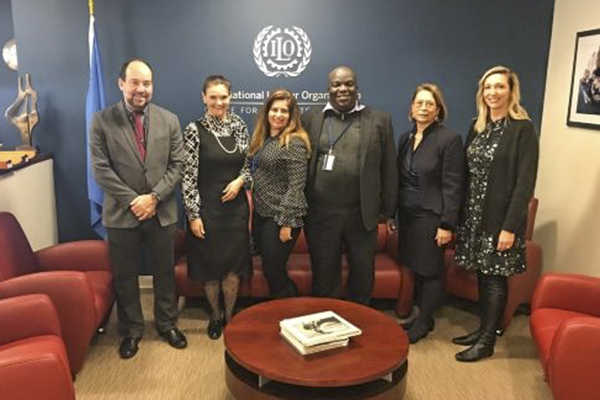 New York, 28 November 2018 – The ILO’s solution forum successfully showcased the good practices for Decent Work and provided recommendations towards BAPA+40. Moderated by Ms. Rie Vejs-Kjeldgaard, Director of the Department of Partnerships and Field Support of the ILO, the session successfully showcased the importance of South-South and triangular cooperation (SSTC) in the following projects: (1) “Peer Learning Seminar on a Just Transition and Climate Resilience in Samoa” which contributes to ILO’s cross-cutting policy driver of Just Transition to environmental sustainability, (2) “Regional Initiative Latin America and the Caribbean Free of Child Labour: New South-South trends”, which contributes to ILO’s International Programme on the Elimination of Child, Labour and Forced Labour (IPEC+), (3) “Enhancing Sierra Leone women entrepreneurs’ empowerment and resilience in cross-border trade within the Mano River Union (MRU) through learning and experience sharing from the East African Community (EAC)” which contributes ILO’s Flagship program on Jobs for Peace and Resilience, and (4) “TRANSFORM – Leadership and Transformation Curriculum on Building and Managing Social Protection Floors in Africa”, which contributes to ILO’s Flagship Programme of Building Social Protection Floors for All (SPF). The panelists demonstrated the importance of SSTC in their respective projects and how this cooperation modality has been contributing to the achievement of development results, including those related to Decent Work Agenda, and the Sustainable Development Goals. Against this backdrop, the panelists emphasised on the needs to scale up the effective application of SSTC in the next development projects. Mr. Chu Ling recommended incorporating issues related to climate change and environmental sustainability, with a focus in the Pacific. He also highlighted the importance of promoting knowledge-sharing platforms among countries in the region, especially those are being exposed to rising sea levels, regarding climate change issues. Mrs. Sasha Deer-Gordon recommended promoting the shift/better mobilisation and replication of global south solutions. She also suggested that stakeholders and development partners should systematise good practices based on similarities and synergies and targets of SDG 17 must be incorporated to all development programmes, among which the initiatives combating child labour and forced labour in the Americas. Ms. Nyaibor Ngombu recommended to include more systematically Fragile-to-Fragile Cooperation with a gender lens or perspectives into Development Cooperation approaches and BAPA +40 processes. She underscored the importance of leaving no one behind in all development fora. Ms. Portia Kekana urged all member states from the Global South to seriously consider the package for capacity building and knowledge sharing for their respective role players within the Social Protection environment. She also suggested that one of the concrete outcomes will be to use the experience of “TRANSFORM -Leadership and Transformation Curriculum on Building and Managing Social Protection Floors in Africa”, in order to further contribute to ILO’s Flagship Programme of Building Social Protection Floors for All (SPF). In conclusion, Ms Rie Vejs-Kjeldgaard expressed her gratitude to panelists and the audiences. She reiterated ILO’s full commitment to the promotion of SSTC in its initiatives, especially the five flagship programmes and among its constituents (governments, employers and workers), and towards the BAPA+40, hosted by the Republic of Argentina in Buenos Aires in March 2019.